I must admit I’ve been waiting with anticipation for the debut album from Shiny and the Spoon. The duo of Amber Nash and Jordan Neff came to my attention when my friend Tony Moore posted a link online to their cover of A-Ha’s “Take on Me.” It was brilliant and I was hooked. So I was giddy with excitement when Amber contacted me about a promo copy of the self-titled album: Shiny and the Spoon. The EP opens with “Simple Song,” which has become my favorite tune. It is indeed simple, in the most warm and endearing way. Amber’s lead vocal and harmonies are a lovely introduction, especially accompanied by their trademark ukulele sound. “Buried” brings some harmonies of the most mellow kind. I found myself singing along with the chorus at the first listen. And who doesn’t love a touch of haunting harmonica? Even this electro chick does. “Canary in a Coal Mine” once again demonstrates how the band shines (pun totally intended) with simple, clean arrangements. Amber’s voice already has a old-timey feel, and the vocal effect on this one just dials that up a notch. 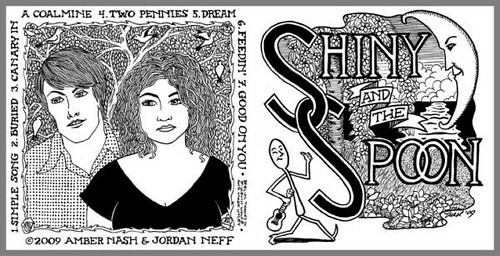 “Two Pennies” shares the vocals between Amber and Jordan. Their songs have such an intimacy that I really admire. I find myself trying to decipher exactly what the lyrics are all about. I’ll have to enjoyably ponder it for a while. This track brings to mind Over the Rhine’s song “Don’t Wait for Tom.” Americana at it’s best. “Dream,” like “Simple Song” is another pleasant and sweet tune with fetching harmonies. My daughter is going to get so sick of me singing these songs in the car, but that’s just the way it is! “Feedin” is probably the most surprising track for me. Jordan takes the lead on this one. lt has a classic, old-fashioned Country-Western vibe, with haunting lyrics. “Well now I’m takin’ the train, so you can quit cryin. It’s not like I complain, so I’ll just quit tryin’.” There’s a whole story behind these words and it makes me want to know more. Finally, “Good on You” brings it all together with a folky, catchy nursery rhyme wrapped in one cheery little tune. Charming. You can’t beat songs about leaving, saying goodbye and eating your last breakfast. Every song brings a little surprise – be it a trumpet or ukulele solo or a whistled refrain. The EP will be launched on January 22 with a release party in Cincinnati at Roh’s Street Cafe. To learn more, visit Shiny and the Spoon on MySpace or at their soon to be launched Shinyandthespoon.com.